Thick and creamy, perfect Chocolate Fudge is one of my favorite easy holiday treats! 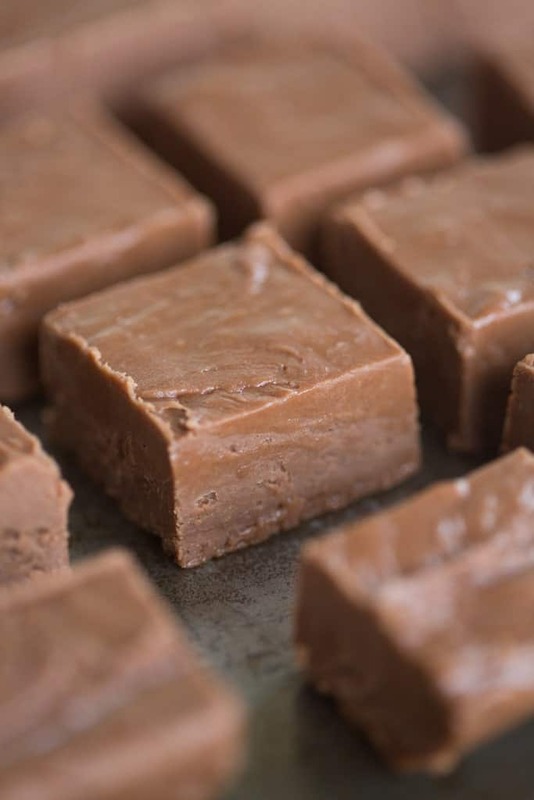 This homemade fudge also makes a great homemade holiday gift! I already have all things Christmas on my mind lately. I feel like it’s completely acceptable to have the spirit of Thanksgiving and Christmas combine to make a festive and fun November and December. We’ve been blasting our Christmas music for several weeks already and I enjoy every minute of it! Twenty-five days in December is just not long enough for me. I’ve also already made two batches of my favorite homemade eggnog, too. Would you judge me less if I use the “I’m pregnant” excuse? What are the ingredients for fudge? 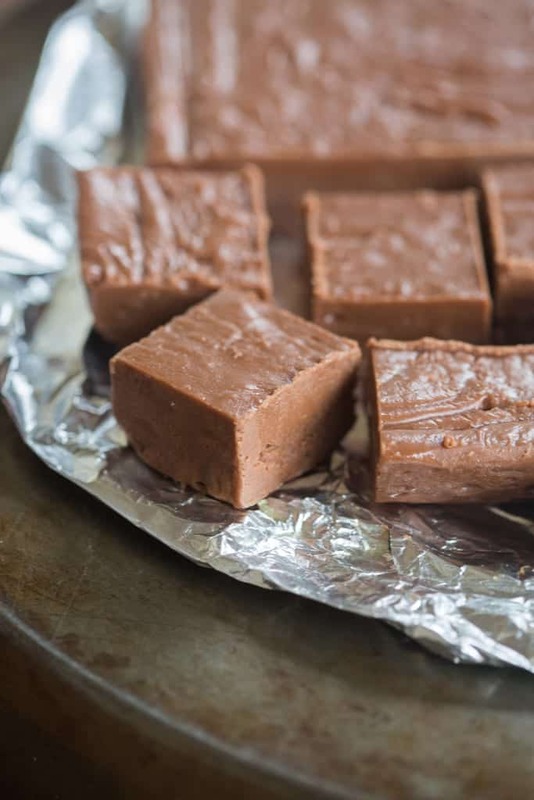 To make this homemade fudge, you need the following ingredients: butter, milk chocolate chips, semi-sweet chocolate chips, vanilla extract, evaporated milk, sugar, and mini marshmallows. Homemade candy has always been one of my favorite Christmas traditions. Every single year my mom would make her famous Homemade Caramels for our friends and neighbors. This perfect chocolate fudge is a favorite, as well as Caramel Cashew Clusters. The great thing about this Perfect Chocolate Fudge recipe is how versatile it is. You could use different flavors of chocolate chips (like peanut butter/chocolate, or mint/chocolate) to change the flavor. You could just add a few drops of mint extract for a peppermint flavor, and you could also add nuts. 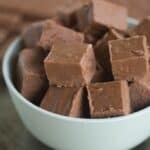 There are tons of possibilities, but this is an awesome base recipe for a perfect thick and creamy chocolate fudge. In a saucepan, combine evaporated milk, sugar, and marshmallows. Stir and bring to a boil for about 10 minutes. Pour the hot mixture on top of the chocolate chips, vanilla and butter (that should be combined in another bowl). Use an electric mixture to combine until smooth. Pour the mixture into your pan and chill in the refrigerator! Thick and creamy, perfect chocolate fudge is one of my favorite easy holiday treats! Makes a great homemade holiday gift as well! Add the butter, both types of chocolate chips, and vanilla to an extra large mixing bowl. Set aside. Line a 9×13'' pan with tin foil and set aside. In a very large heavy saucepan, combine the evaporated milk, sugar, and marshmallows. Cook over medium heat, stirring frequently until the mixture comes to a boil. Boil for about 10 minutes--it should be light golden brown in color. (If using a candy thermometer you will want to cook it to around 235-240 degrees F. Temperature will vary depending on altitude, humidity etc., but just watch the clock and make sure it boils for about 10 minutes). Grease your foil-lined pan with cooking spray. Pour the hot mixture into the bowl with the chocolate chips and use an electric mixer to gently combine everything until melted and smooth. Pour into prepared pan. Chill completely in the refrigerator. Once cooled you can pull up on the edges of the tinfoil to lift the entire slab of fudge out of the pan. Cut into small squares, or I like to cut it into a few "bricks" that I wrap in tinfoil and give as gifts. Store fudge wrapped tightly in the fridge so it doesn't dry out. 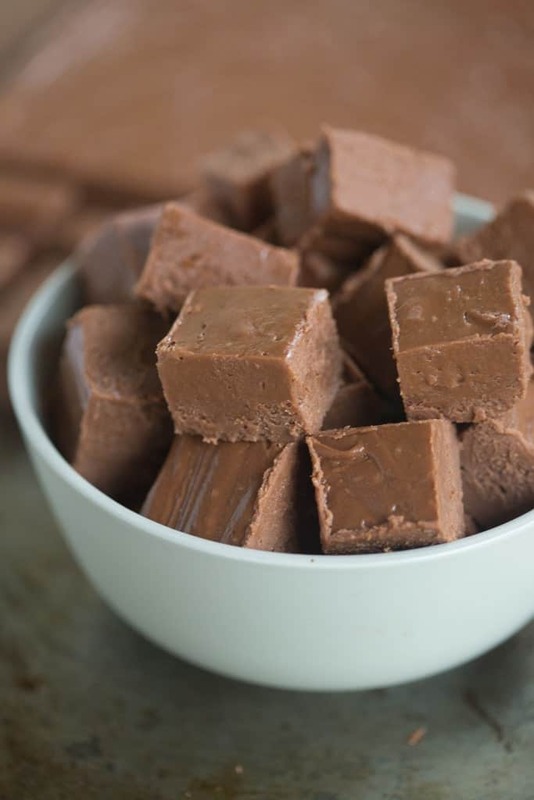 Feel free to mix up the flavors of this fudge by using different flavors of chocolate chips. You could also add nuts (walnuts or pecans). For the butter were the sticks half cup sticks or a full cup sticks? Tried your perfect fudge for XMAS gifts and it is Great. Looks like it is now a new tradition. ps I have made several of your recipes and every single one has been amazing! It shouldn’t really matter either way, the hot mixture will melt it 🙂 Hope you enjoy it! how many regular marshamallow can we use if we don’t have minis?Should we cut them down in size?